Music reminds me of so many of life’s experiences. I thought I would share a few of them with you here for Music Monday. Back in October 1999, I took a personal sabbatical… a trip to find myself and to make a major decision in my life. I had never been to most of New England and wanted to see that part of the country. Just myself, driving around the states in a rental car. 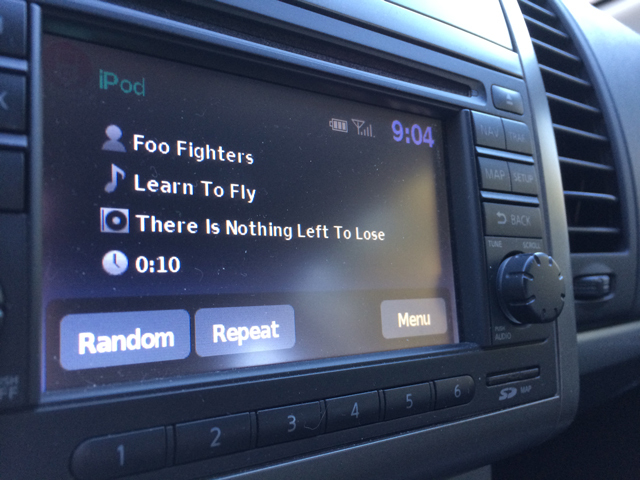 The album “There Is Nothing Left to Lose” wasn’t out yet, but the first single “Learn To Fly” was getting heavy airplay. And I heard this song many times during my ventures into Vermont, New Hampshire, Maine, Rhode Island and Massachusetts. And to this day, whenever I hear this song, I think of my 6 days in New England and the time I had seeing places I had never seen before and making decisions that were pivotal in my life. This song was my first exposure to this Chicago-based duo. Which I am sure was the case for most that were not familiar with the grunge sounds of Local H.
I had just switched jobs from one hellacious and short stint as a Network Admin at Pioneer Valley Hospital to a great job at a telecom company called Teltrust. My ex-wife and I bought plane tickets to fly from Salt Lake City to Southern California to visit Disneyland for a few days. The plane tickets were $25 each way for each person. Who couldn’t turn down plane tickets for just over $150 for three people? Not us, that’s for sure. My favorite radio station growing up in Orange County was KROQ and I heard this song while driving around Los Angeles and Orange County during that trip. Not only did it paint the picture of me driving around the freeways, but it embedded that Local H song into permanent memory of that trip each and every time I hear it today. Back in the early 90’s, my ex-wife and I maintained a fresh water fish tank. We had several fish, including a couple Blue Rams. We had trouble naming these fish. We kept saying Blue Ram over and over and as much as we were into music, the names Lou Gramm and Lou Reed would flow together in our repeated ramblings. The above song “Last Great American Whale” was pretty popular at the time and given that, the two fish got their names: Lou Gramm and Lou Reed. With yesterday’s passing of Lou Reed, I was instantly reminded of these little fish we had. Of course, the fish died many years ago, with Lou Reed’s music playing on, as it will for years more after his death at the age of 71. Leaving you with one last Lou Reed classic from his short time with Velvet Underground. Share your music memories below in the comments. Or post on your own blog. I want to read your ties of songs and bands to life’s events. I had no idea it was going to hit me this way, but Lou Reed’s death on Sunday really affected me. Spent the large part of the afternoon listening to some Velvet and his solo stuff. Gia said to me “I never knew you were such a fan”, and I guess I didn’t realize it either. But it was down there, so ingrained in just about all the music I’ve ever loved since I was in high school. Lou and Bowie. The two giants. And he was SUCH a great New Yorker! Ugh. Songs have a way of instantly transporting you back to a certain time of your life. Only the other day I was listening to an album I hadn’t heard in years and just hearing music beginning on the first track took me way back. Music is awesome like that. Glad to know I’m not alone in how music is the transportation to a time and place. I’m the same way with music. I should do a post similar to this. I can’t get over the fact you took that sabbatical and travelled to a place you have never seen before. Too awesome. I am the same, a song can take me right back to a time, a place, a thought, even to a person. It’s more than powerful. Welcome to the blog. Thank you. It was a much needed trip, that’s for sure. Music is very powerful.